Geography Professor Ming Tsou's program maps tweets about ongoing emergencies such as wildfires and bad traffic snarls. 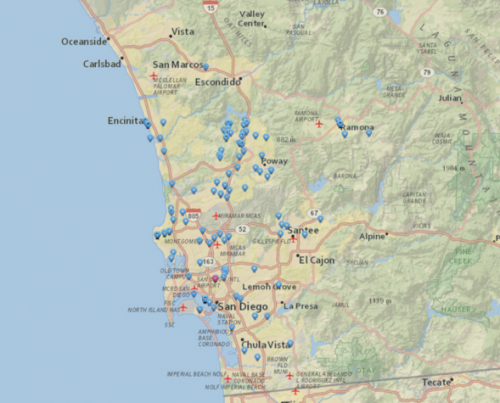 San Diego County is partnering with San Diego State University to develop a new social media–based platform for disseminating emergency warnings to San Diego citizens. The project, spearheaded by Ming-Hsiang Tsou, an SDSU geography professor, aims to allow San Diego County's Office of Emergency Services to spread disaster messages and distress calls quickly and to targeted geographic locations, even if traditional channels such as phone systems and radio stations are overwhelmed. The project originates from a $1 million grant that Tsou received earlier this year from the National Science Foundation. The grant supports Tsou's ongoing research into the ways people use social media to communicate about breaking news such as natural disasters, disease outbreaks and emerging voting patterns. Tsou directs the SDSU Center for Human Dynamics in the Mobile Age, one of the universities Areas of Excellence. "We want to know how people disseminate information in different kinds of situations," Tsou said. "Why does some information go viral and other information doesn't? By understanding the mechanisms of Internet memes, we hope to apply that knowledge to disaster awareness. We want to use technology to make emergency warnings go viral." At the request of Supervisor Ron Roberts, the San Diego County Board of Supervisors unanimously directed Chief Administrative Officer Helen Robbins-Meyer to allow the Office of Emergency Services to work closely with SDSU's Center for Human Dynamics to develop software and tools to improve the county's ability to use social media for disaster communication and response. "This social media technology developed by Professor Tsou adds another innovative tool to our ability to react during an emergency and even get out ahead of something before it becomes a problem," Roberts said. "We are very excited that he and the university have chosen to partner with the county and we anticipate some great results going forward." Central to this project is the idea that hugely influential social media users are a key component of viral messages. Using Twitter as an example, Tsou said that if tweeters with a lot of followers retweet some emerging Internet meme, the meme is much more likely to catch on in the greater Twitter universe. Tsou plans to implement this concept into emergency warning systems by reaching out to the top 1,000 Twitter users in San Diego County and asking them to agree to retweet the county's emergency messages. These messages might alert citizens to road closures, evacuation notices, wildfires and other emergency notifications. "If we have 1,000 highly influential volunteers retweeting these messages, almost everybody in San Diego will get the message," Tsou said. Additionally, county officials will be able to use the new system to monitor social media for rumors and false information originating from other channels, then address those falsehoods succinctly and directly. The benefit of using Twitter, Tsou added, is that emergency officials could also use geographic targeting to make their messages more effective. Because Twitter users can choose to embed their GPS coordinates into their tweets, officials could direct retweet requests to volunteers who are most likely to impact an affected area rather than deluge the entire county with tweets that only are meaningful for a small part of the population. Officials within the San Diego County Office of Emergency Services are currently receiving training on using the system, as well as offering feedback to Tsou on how the system could be tailored to best fit their needs. The county is expected to test and use the system throughout its development.